also called the Mumford School. At one time, there was a county-wide graduation for the eighth grade students from within the county's 78 school districts (not all were country schools). 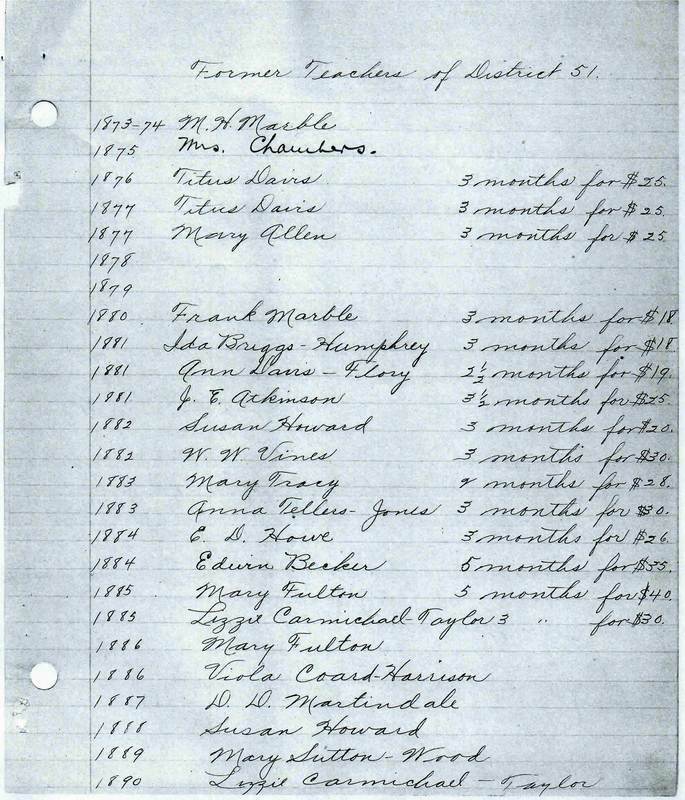 Here is a list of the 1926 8th grade graduates, shared by Susan Carter, whose aunt Nellie Morrison graduated from the Hays School in District 52. District 17, Maple Grove: Floyd Cunninham and Marjorie Jones. District 32, Pleasant Valley: Hubert Svanda. District 34, Blacklaw School, Lester Krofta. District 35, Bunker Hill: Velma Wopata, Berl Stafford, and Fleeda Stafford. District 52, Pleasant Hill, also known as the Hays School: Gladys Reuter and Nellie Morrison. District 65, Wood Hill: Raymond Cook, Charles Morris, and Zelma Mertes. I found my dad...Hubert Svanda ...district 32! The building is long gone. In modern times, you reach the site by driving west out of Table Rock on Highway 65. A mile or so out, there is an old wooden bridge on the south side of the highway crossing the railroad track. Turn left and cross that bridge. Follow the dirt road to its end at a t-intersection and turn right. The school is on that road which has several curves to it, including one to the left at the top of the first hill. If you get to a place where there is a house on the right, you've gone too far. 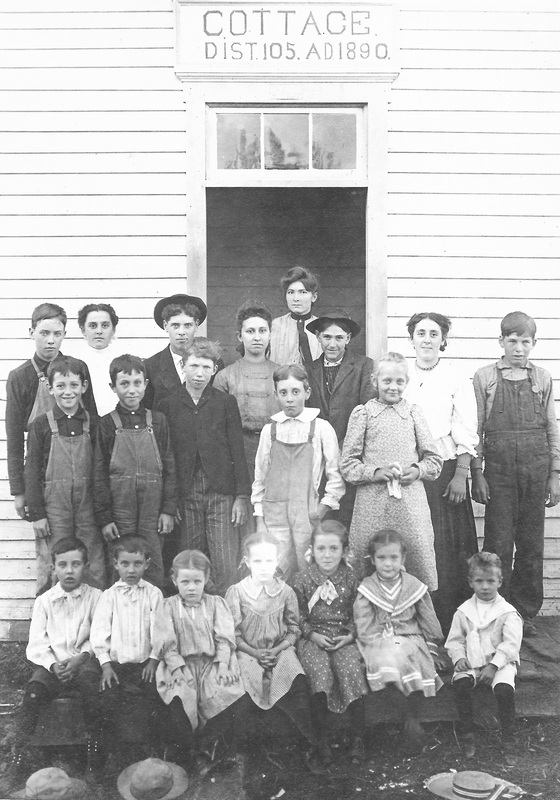 Students at the Hunzeker School, included in the 1917 history. No names. The picture below is undated, but offers a clue to its age. The blonde girl in the first window is labeled as Hattie Lane. Lane Gibbs was born in 1876. How old does she look? This photo is certainly from the 1880s. 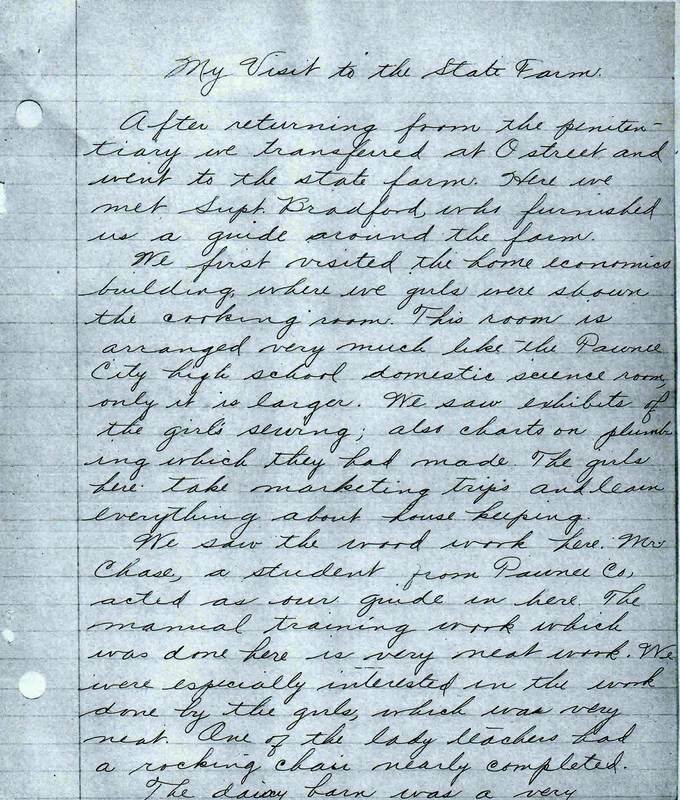 By the way, that little girl in the window lived to be 83 years old; she died in 1959; her obituary says that she served as one of the very first telephone operators in Table Rock. Taylor school. There are two names, the little girls in the front windows. Arrows point to Hattie Lane and to Gail? This photo is a photo of a photo and was hampered by an unavoidable glare. Taking the photo at an angle helped but did not eliminate it. It is behind a plastic covering and difficut to scan, but it will be scanned eventually for a better copy. 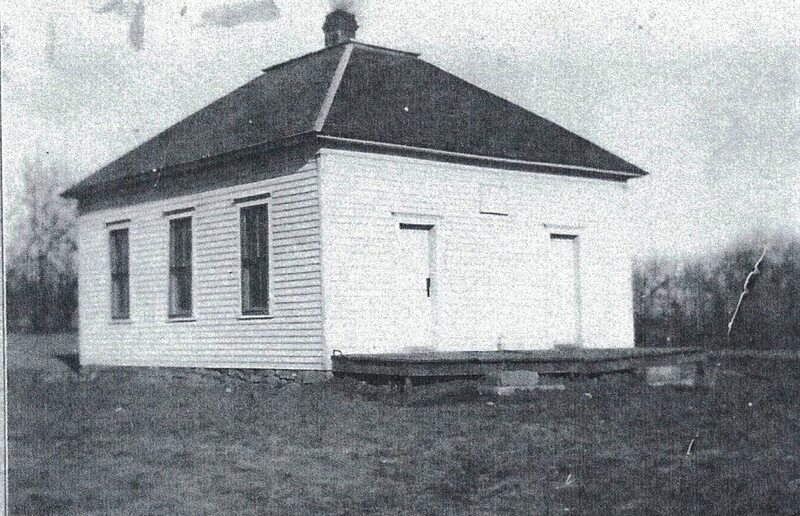 Photo 1907, in the Maple Grove Country School collection. Taylor school students, no dates or names. Roy Mullin points out his father Jerry Mullin -- front row, third from the right, 1st one on his knee. Photo 3508, shared by Shelly McClintock. 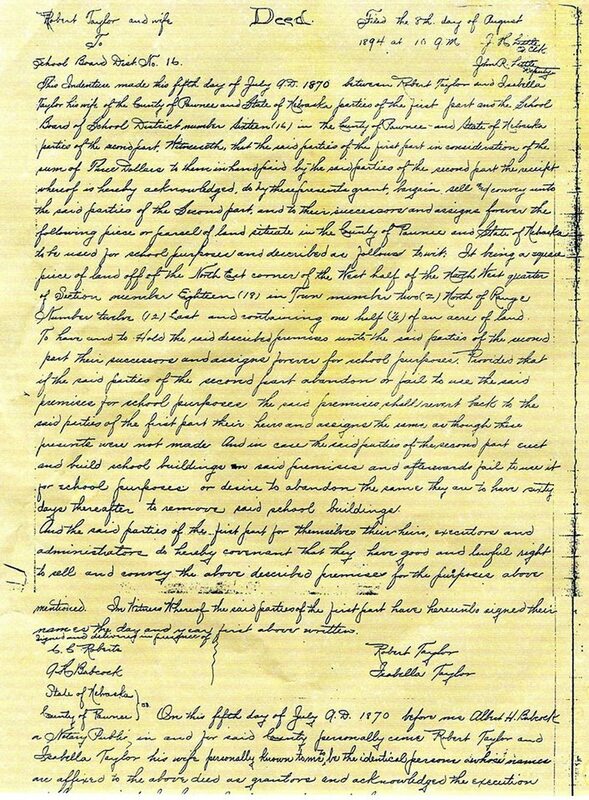 The deed is dated 1870, and was filed/recorded in 1894. Shelly McClintock shared this. The sign from the old Clear Creek schoolhouse is in the Maple Grove School Museum. The sign from the Pleasant Valley school is in the Maple Grove Schoolhouse Museum. 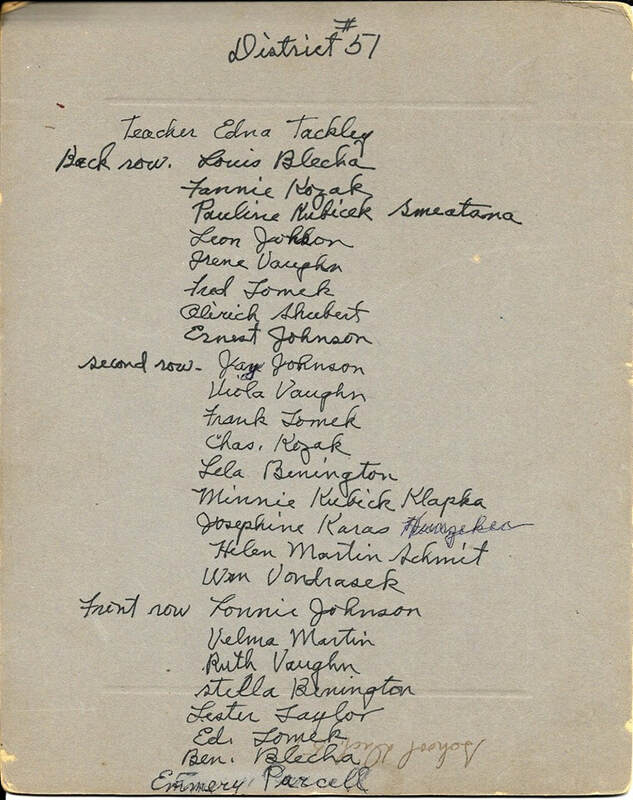 Names cited: Grace, John, and Minnie Albin, Lily Blaker, Ella Viola Clark (teacher), Rudolph Flider, August Havel, Anna, Hellen (or Helen), and James Hruska, Lon Kadlec, Annie Kalina, Charlie Kalina, Joe, Rudolph, and Tony Kalina, Pauline Kubic, Hilda, Hulda, Leo, and Mary Lionberger, Frida, Jesse and Lydia Rist, Annie, Charlie, and Josie Rousek, and Elsa and Wilber Stroud. Also Frank Fritch (school board), Frank Kalina (school board), and W. Lionberger (school board). Photo 629, circa 1919 is below. Bob and Frances Blecha posted this great picture on the Historical Society's Facebook group page. The students are identifed as follows: Back Row, teacher Mabel Collins, Elsie Karas, Emil Kalina, Rudy Fritch, Sr., Ed Kalina. Front row: Jim Hruska, Lawrence Stehlik, Ed Blecha, Ella Karas, Lilly Karas, Lillian Hruska. There were quite a few Facebook comments when Frances posted it. Marge Hunzeker had never seen this; she asked for and was promised a copy. Frances said to Marge, “Ed and Ella went through a lot of years together! I think Bob says this is the youngest of them in the same picture. And I think Lawrence Stehlik looks just like .... Lawrence Stehlik!” Marge: “That's what Clark said about Lawrence when he saw the pic.” Marge: “I I didn't realize that Lavon looks a lot like his dad.” Frances: “yes, he does, now that you mention it.” Marge: It's kind of funny that dad & Lillian Blecha lived close in the country then moved across the street from each other in town.” Frances: The photographer took the pic kinda crooked ... but, hey, it's nice to have now! I've tried to straighten it in PhotoShop, but it just doesn't work.” Luella Hinrichsen: “ I like the way Lilly & Lillian are looking at each other! I was wondering if there would be any pictures of Aunt Lillian!" Last day of school picnic, 1950s, shared by Edward Tomek whose wife Charlene was the last teacher. The little blond toddler was born in 1956. This may be the very last such picnic. Photo 1037. 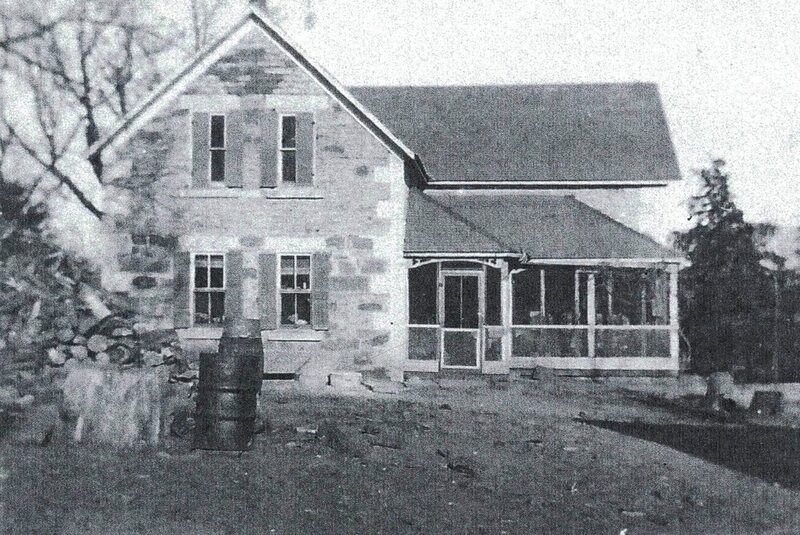 This photo of the Blacklaw School is undated. The youngest child, Emil Sedlak, was born in 1908. The oldest, Mary Petrasek Wopata (who was possibly the teacher) was born in 1894. Front row: standing is Emil Sedlak. Seated: Henry Krofta, Frank Krofta, and Bill Sedlak. Middle row: Blanche Dobrovolny, Anna Blaha, Julia Blaha, Albina Sedlak Fidermutz, Emma Dobrovolny, Charles Dobrovolny, Albert Krofta, and Ed Dobrovolny. Back row: Helen Raitora, Bessie Dobrovolny Luksik, Mathilda Raitora, teacher Mary Petrasek Wopata, and Olga Rabstejnek Sochor. Not located in FindaGrave.com: Bill Sedlak, Blanche and Emma Dobrovolny, Anna and Julia Blaha, and Helen and Mathilda Raitora. 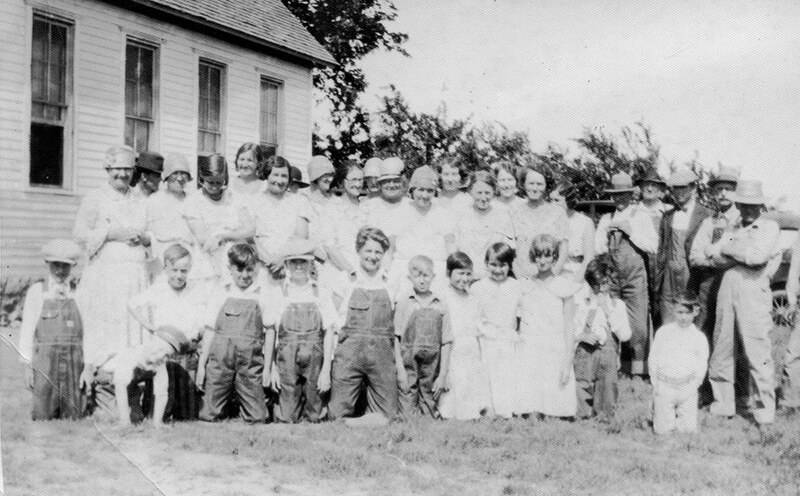 The teacher and students of the Blacklaw Country School for the school year 1944-1945. The teacher, Lillian Giles is in the back row on the left. Her students in the back row were Richard Dobrovolny and Adyce Fritch Cumro. In the front row are Gary, Robert, and Donald Bedea. 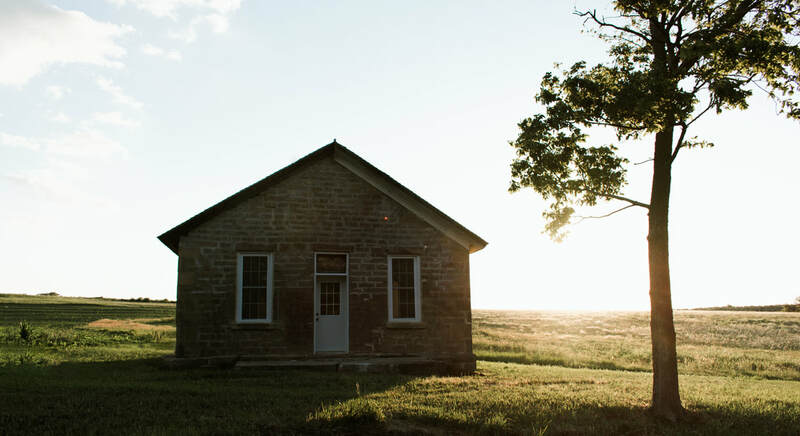 The school house was across Highway 4 south of where Larry and Karen Gilbert live now (2017). ​This photo was shared by Brad Bowen, Lillian's son. Lillian's first husband died in World War 2 -- during the school year in which this picture was taken -- and she remarried John Bowen, Brad's father. ​Here are brother and sister Joe and Mary Ann Sochor. Joe taught at the Blacklaw School for three years. When? Not sure. He graduated from high school in 1945 and went to the University of Nebraska and taught at the school. Don't know if he taught first (you needed only a teacher's certificate not a college degree) or went to the University first. 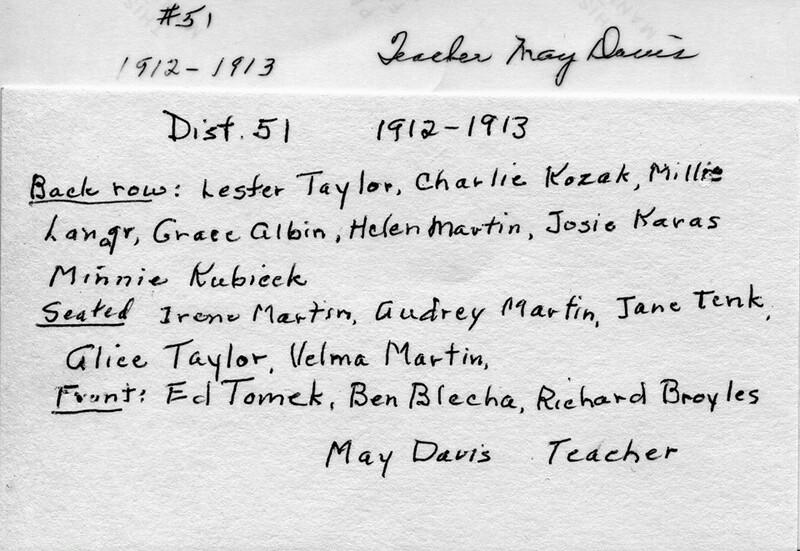 1, Delphine Goodenkauf; 2, Rudolph Wopata; 3, Jess Vondrasek; 4, Teacher Mary O’Connel; 5, Martha Vanlaningham (original misspelled Vanlingham); 6, Margaret Goodenkauf; 7, Felicia Goodenkauf; 8, Bessie Wopata; 9, Julia Wopata; 10, Freda Kuhlman; 11, John Kuhlman; 12, Joe Wopata; 13, Violet Boone; 14, Ronald Boone; 15, Willie Vanlaningham; 16, Nettie Kovanda; 17, Amelia Goodenkauf; 18, Dora Kuhlman; 19, Emil Goodenkauf; 20, Joy Talbot; 21, Guy Talbot; and 22, George Kuhlman. This is a photo in the Maple Grove Country School Museum. It is badly faded, as they all are, and this is the best retouch that could be done. It is a photo of a photo. 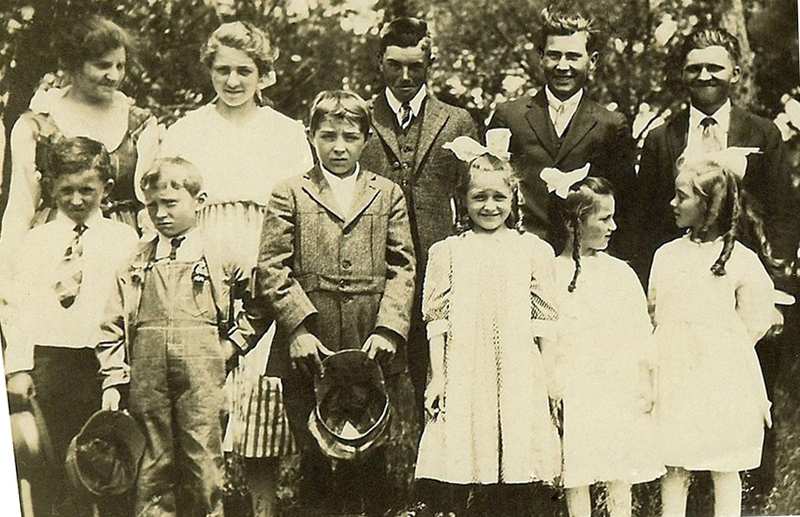 Front row: Robert Laun, Elsie Laun, Virginia Stepan, Rudolph Vrtiska, Jr., and Betty Stepan. Back row: Emil Michal, teacher Bessie Snabl Rexroth, Rudolph Michal, and Glenn Anderson. 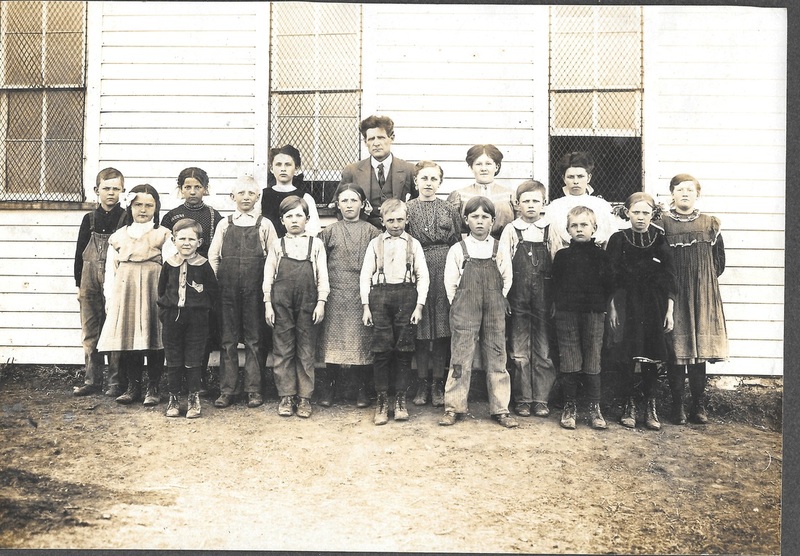 This is Photo 1435, an undated picture of a teacher and students at the Bunker Hill school. A general time frame can be ascertained, as students Floyd and Lloyd Vrtiska were born in 1926. The teacher was Bernice Svoboda, and the students, as indicated on the tag on the picture: Front: Robert Karas, Mary Ann Karas, and Helen Howe. 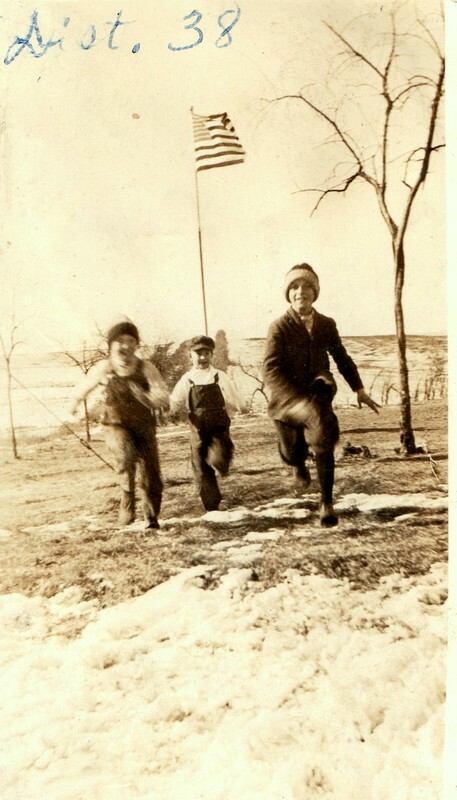 Back: Lloyd Vrtkiska, Floyd Vrtiska, and Johnny Frank. From member JaneSandi Knippelmeyer comes this 1951 photograph of the students at the Bunker Hill School. Her dad and his brothers are included: It is Photo 1444. Their teacher was Janet Minchow. 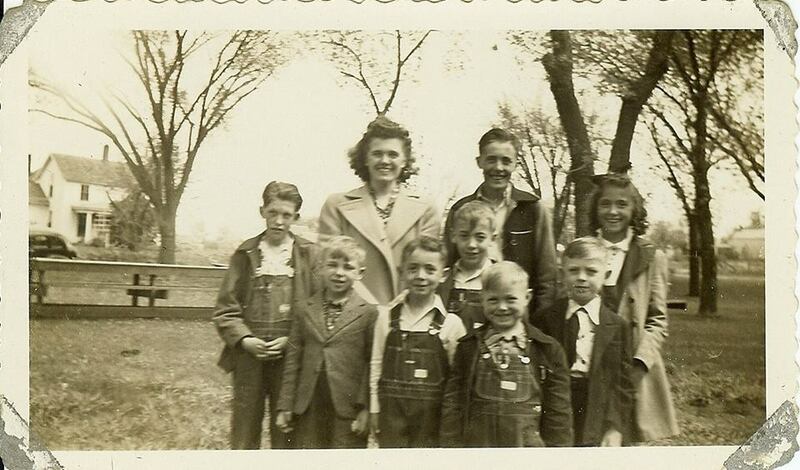 Back row: Wayne Knippelmeyer, Eugene Frederick, Marvin Knippelmeyer, Lois Ahntholz, Eldon Knippelmeyer. Middle: Kenneth Ahntholz, Rich Knippelmeyer, Judy Gottula, Leland Michal, Mary Ellen Michael, June Gilbert. Kneeling: Evelyn Michal, Joyce Knippelmeyer, Rose Mary Michal. Sandy's dad is Wayne Knippelmeyer, the other Knippelmeyers are siblings. Thanks to lifetime Historical Society member Gary Frank for sharing this lovely booklet. Here's a nice history of the school, packed with information and stories. 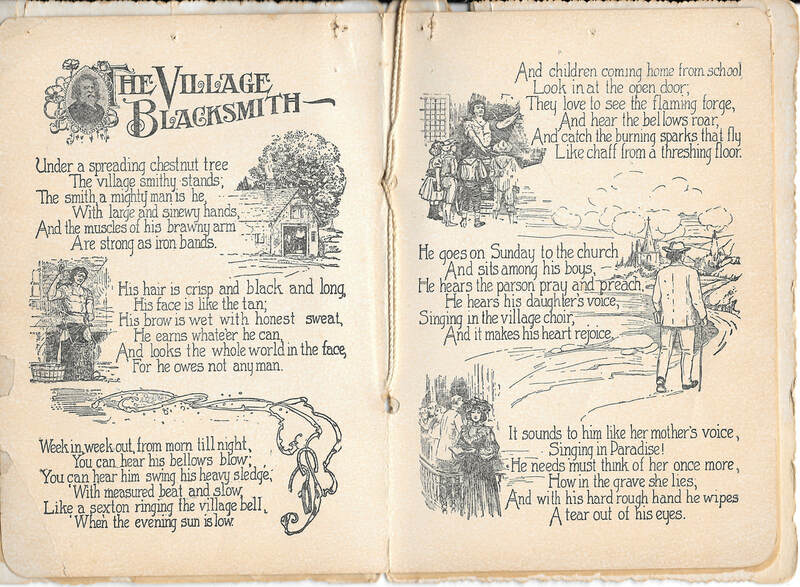 It was written by Mildred Woods Brown, who went there as a child. She not only tells of the school but also of the surrounding residents, giving a history of each piece of land in the school district, who lived there, and any anecdotes she knows. Some time before 1918 -- Herman Fouchek, Donald Jones, & Everette Minchow. Photo 6435. 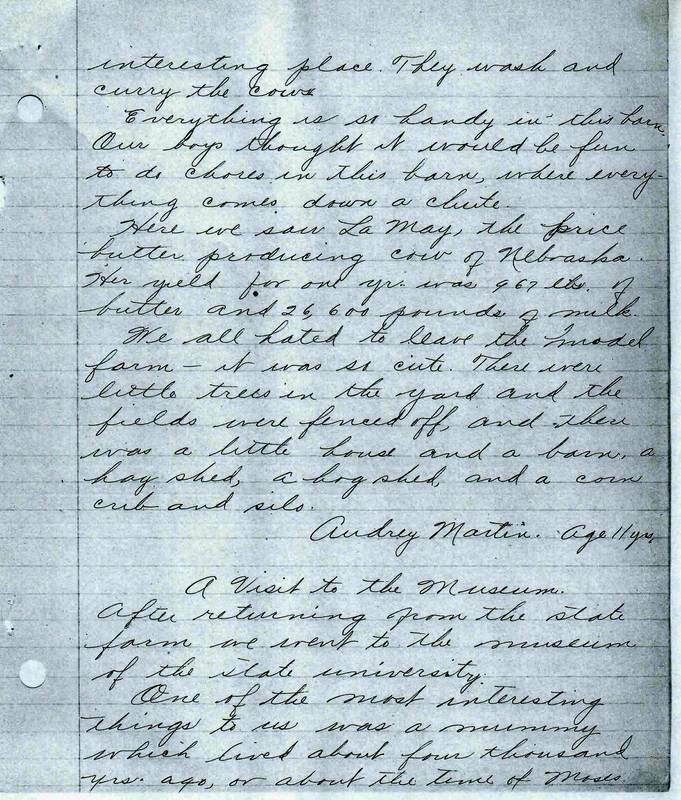 September 11, 1925. Ted Quackenbush found this in the paper. 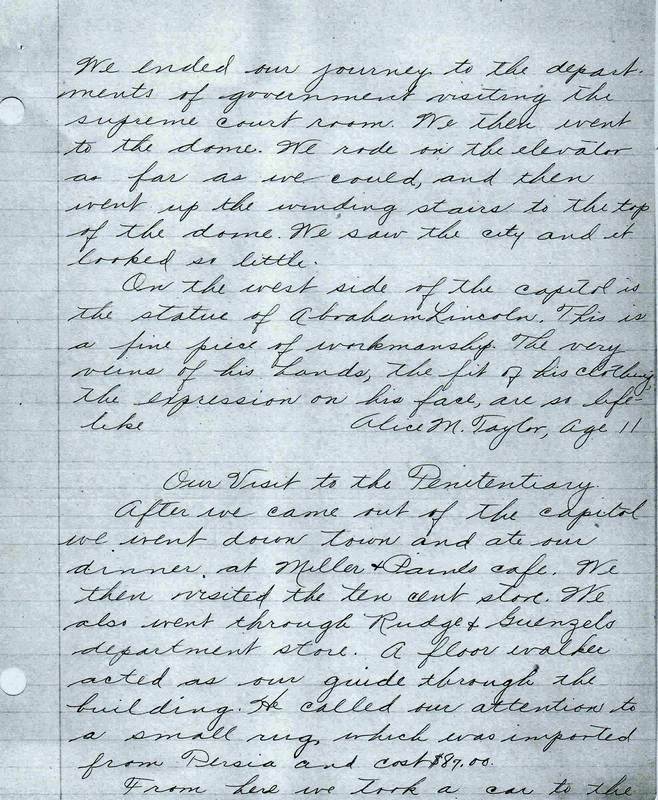 As he points out, this documents that the date over the door was 1925, as it refers to the nice new schoolhouse in District 38! The Bush School in its present location on Workman property, 2017. It is so crowded with trees that it was almost impossible to photograph anything the sides of the building. 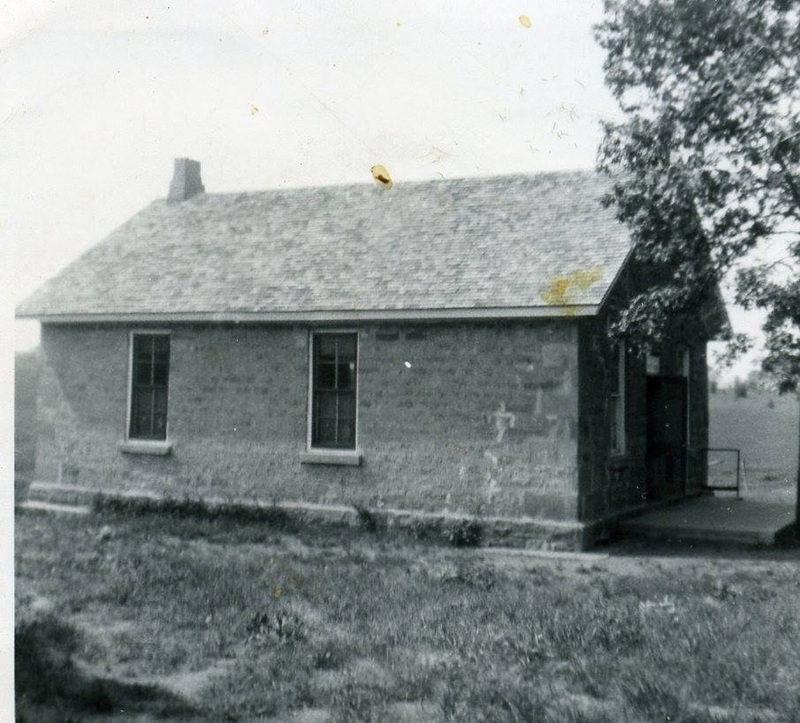 This school was located in the far northeast corner of Table Rock Precinct and the county. Vera Plager, who now lives on the eastern edge of Table Rock Precinct, taught at the school for two terms. When Sharla Sitzman talked with her in 2017, Vera and her husband Richard, who attended the school as a child, told the following little personal history. Vera Plager, was a teacher at Bush Country School, District 40.This school was located in the far northeast corner of Table Rock Precinct and the county. Richard Plager, born in 1928, went to the school as a child. He wife, Vera, born in 1929, later taught there. They live on the eastern edge of Table Rock Precinct. When Sharla Sitzman talked with them in 2017, they gave the following little personal history. Vera grew up in Auburn – she was a Bohling. After she graduated, she went to the college in Peru to get her teacher’s certificate. 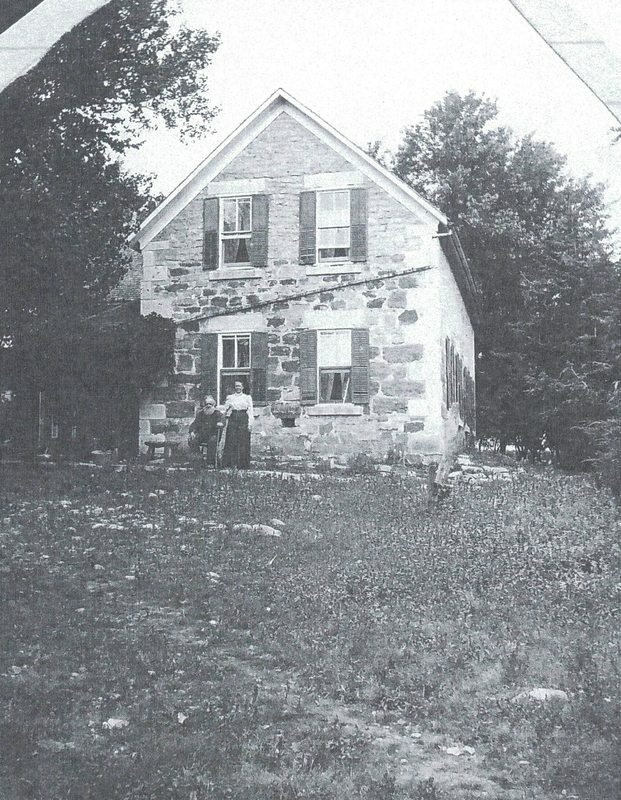 Vera then taught at District 23 country school in Johnson County, near Tecumseh, for a year, where she had about 10 students. 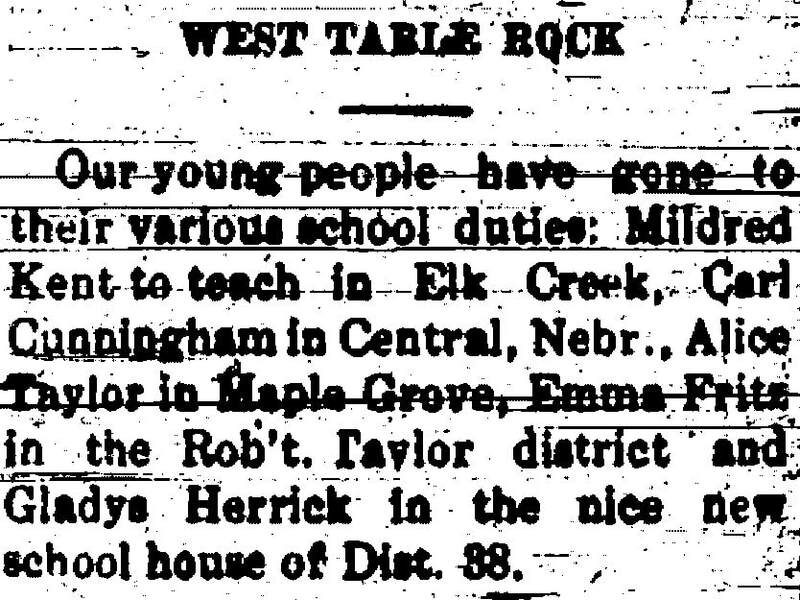 Next, she taught at Hickory Grove Country School in Nemaha County for the 1946-1947 school term. That was the biggest school she was at. There were 25 students in grades 1 to 8. It was also the school where she made the most money -- $185 a month. 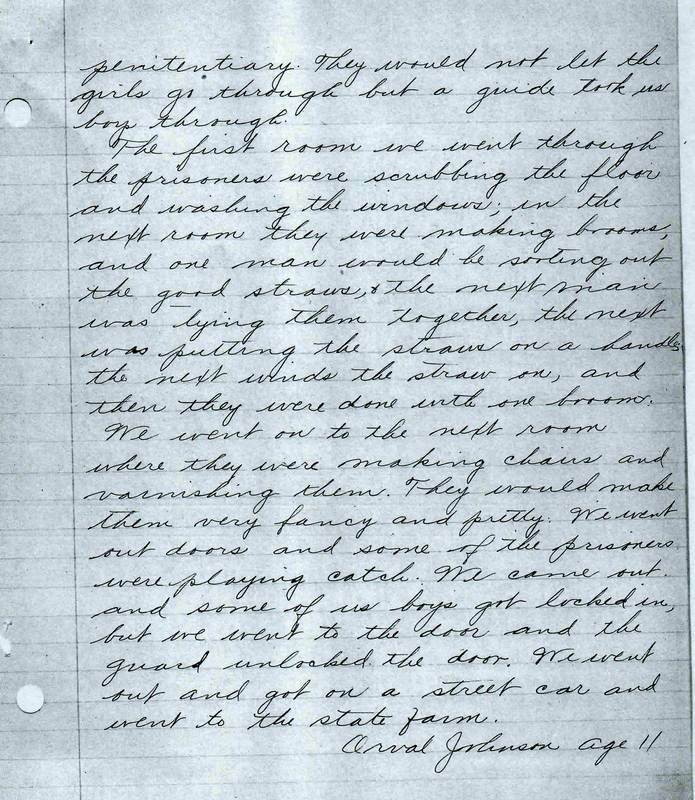 While Vera was at Hickory Grove, her sister was teaching at Bush Country School. Her sister boarded with Richard’s family and that is how Vera met Richard. Vera taught for two years at Bush, for the terms of 1948-1949, and 1949-1950. She had 7 or 8 students there. She doesn’t remember all their names, but they included Shirley Burow, Arlyn and Lois Plager, and a couple of Kuhlmans – Daryl and one other. The end of Vera’s country school career was also the beginning of a long and happy marriage. They had two lovely children, Gene and Susan. (Gene died of cancer in 2012.) They have now been married for 66 years. “When she go to wedding dances, they will find the couple married the longest. They will call out for everyone married for less than 40 years to leave the floor, then 45, 50. It is rare for anyone to have been married as long as us.” They love to dance and have gone to dances all their married lives. I asked whether she had any pictures of the school or the students. Sadly, she does not. “But you can still see the school,” Richard said. After closing, it was moved to the Howard Workman place; he doesn’t know who lives there now. The school that is there was built when Richard was in the lower grades, so probably in the 1930s. A fire destroyed the earlier one. Here is a photograph of one of Vera's students, Shirley Burow, that is in the Historical Society's collection. It is not dated, so the Shirley that Vera taught may have been younger or, probably, a little older. Photo 848i. Here is a photograph of students at the Bush School noted as Circa 1910. It is Photo 261. 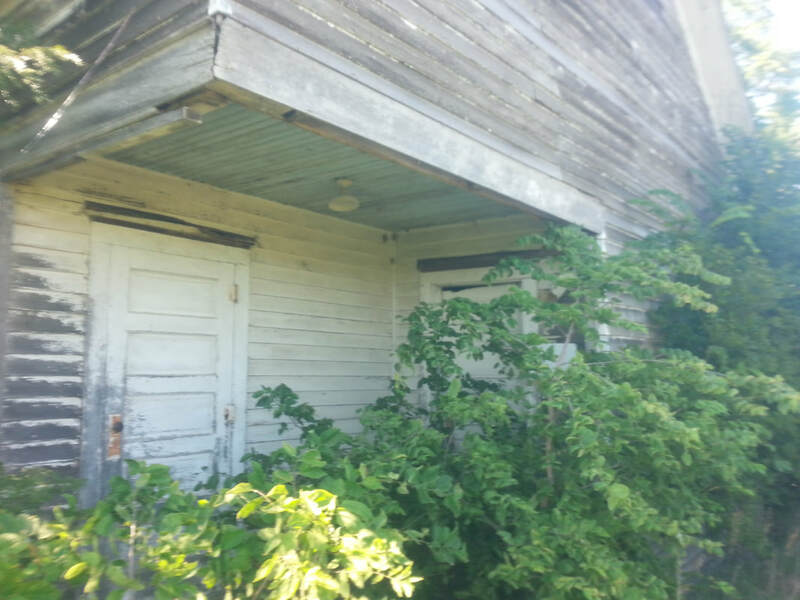 You can get a glimpse of the original school. This photograph is probably a bit after 1910. John Deubelbeiss is in the picture in the front row, 5th from the left. According to his obituary, when he died at the age of 83, he was born near Humboldt in 1900 and the family moved to Table Rock in 1910. John looks a bit older than 10 years old in this picture; you can guess his age, which will also tell you the age of the picture. 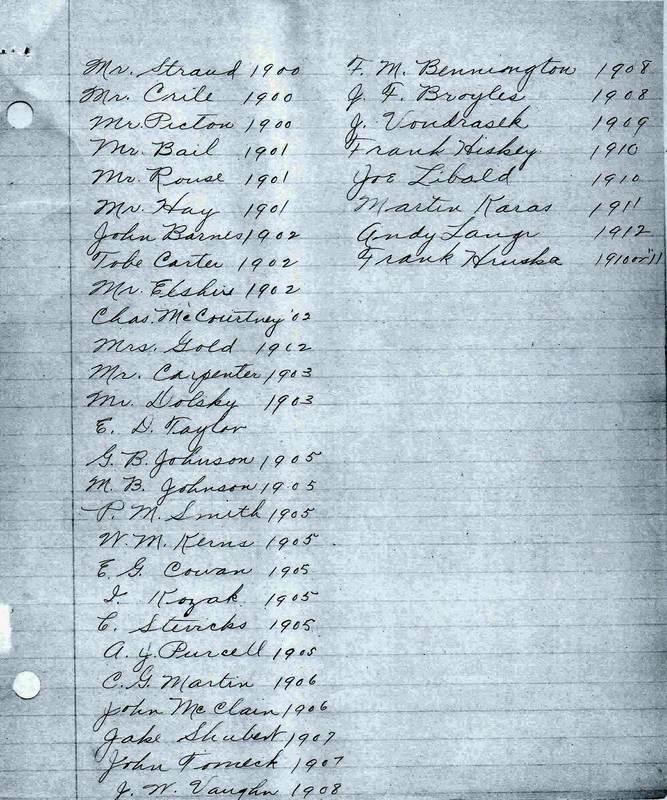 ​There are 17 names identified but 18 people in the picture. 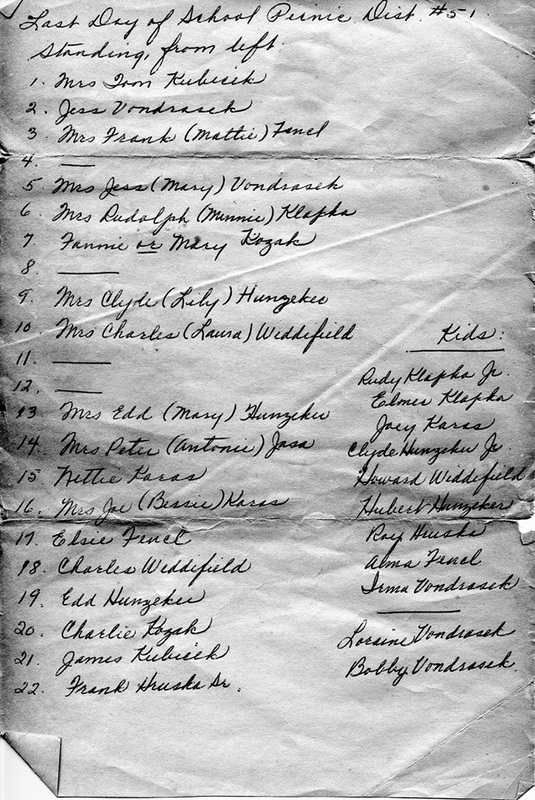 The individuals have been labeled, probably correctly, based on order of boy, girl, etc., leaving a boy in the front row as unknown. In the end, therefore, the names as identified in the individual pics, are uncertain. 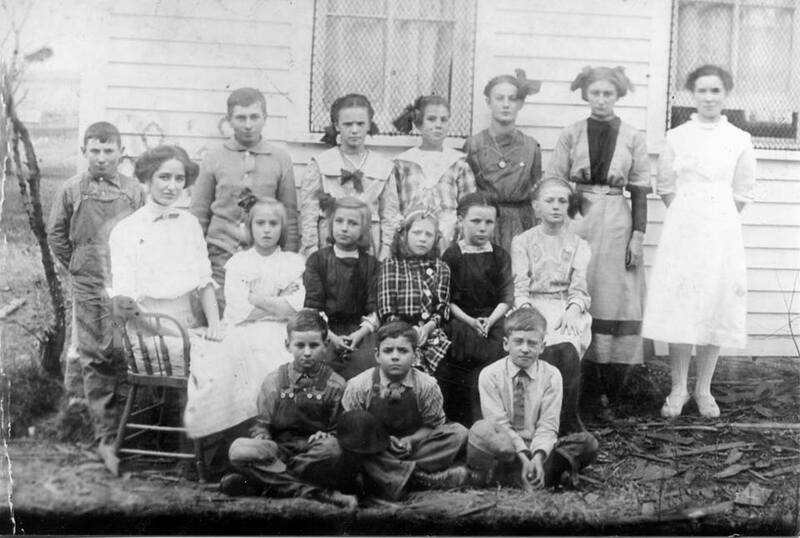 The names as identified: Back row: a Metz boy, Eva Strater, Anna Deubelbeiss, teacher George Swallam, Mae Skillet, Emile Pholman, Margaret Deubelbeiss, and Emma Skillet Wren. Front row: Vera Buchales Mez, Elma Burrow, Dennis Skillet, Hazel Skillet Huert, Carl Burow, John Deubelbeiss, a Metz boy, Ernest Gutzmer, and Louise Anholz. 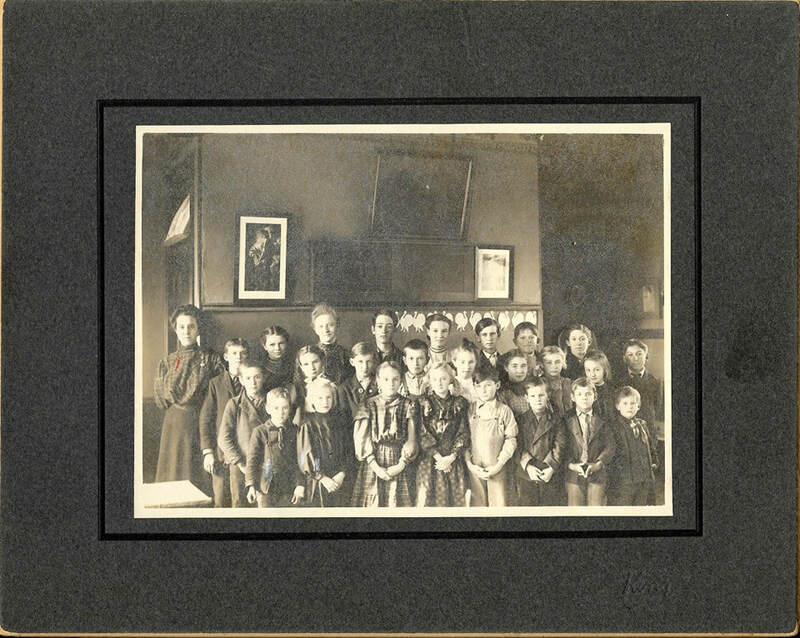 I love these class photos... Four of those pupils were my grandfather Hughie Skilletts siblings!! And there is my grandfather Hughie Skillet . The photo has 17 of 18 students identified. My grandpa is the one who's name is missing . I never knew these photos existed! They were my great aunts and uncles. 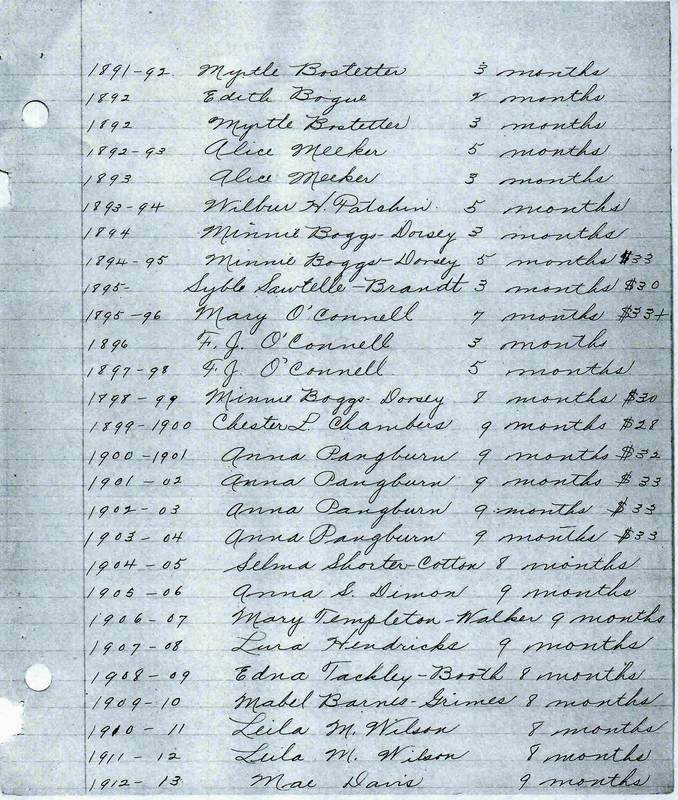 May Skillett born 1895, Emma Skillett 1896, Hazel Skillett 1898 and Dennis Skillett 1901. My grandpa Hugh Skillet was born in 1904. By the way, the Skilletts were all blue eyed, fair skinned, and freckled with strawberry blonde to red hair. Alice Findlay says as of April 2015 that she taught at the Clement School. She didn’t remember what district it was. 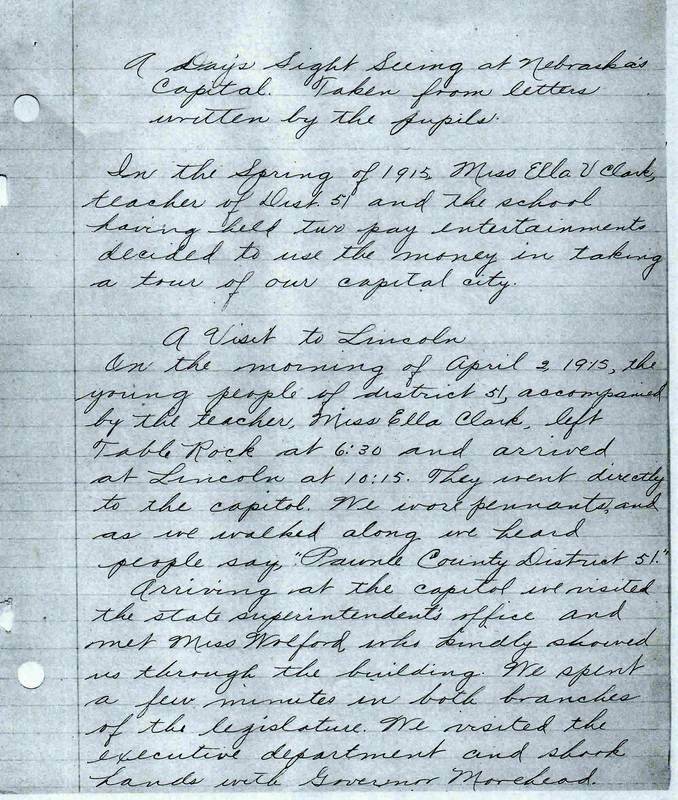 The land description (part of Section 15, Sections 16, 17, part of 20, 21, and part of 22) places this school north of Table Rock. This 1917 history is all we have as of 2018. Photo included with the 1917 history. 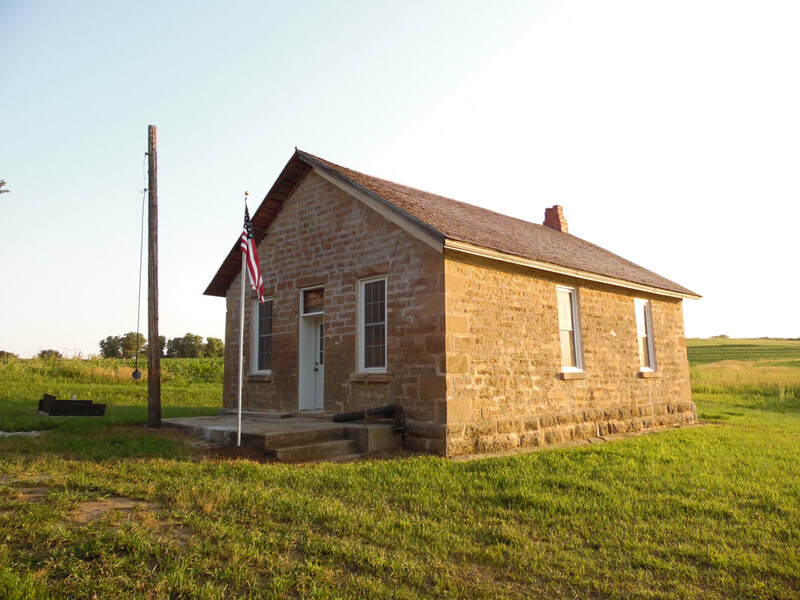 The sign from the old District 51 schoolhouse is in the Maple Grove Schoolhouse Museum. Here is a little history of the school from Bob Blecha, who attended the school. 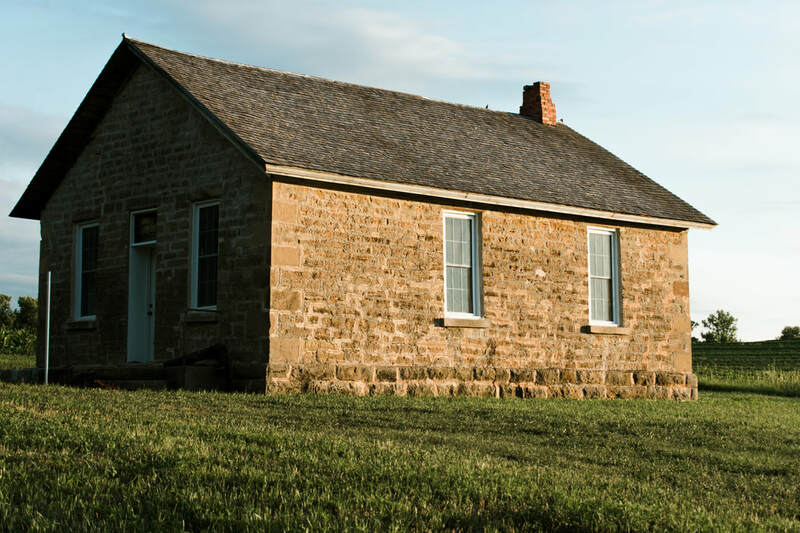 He posted this on the Table Rock Historical Society Facebook Group page in response to a member inquiry about the school: "History of Allison School District 51. 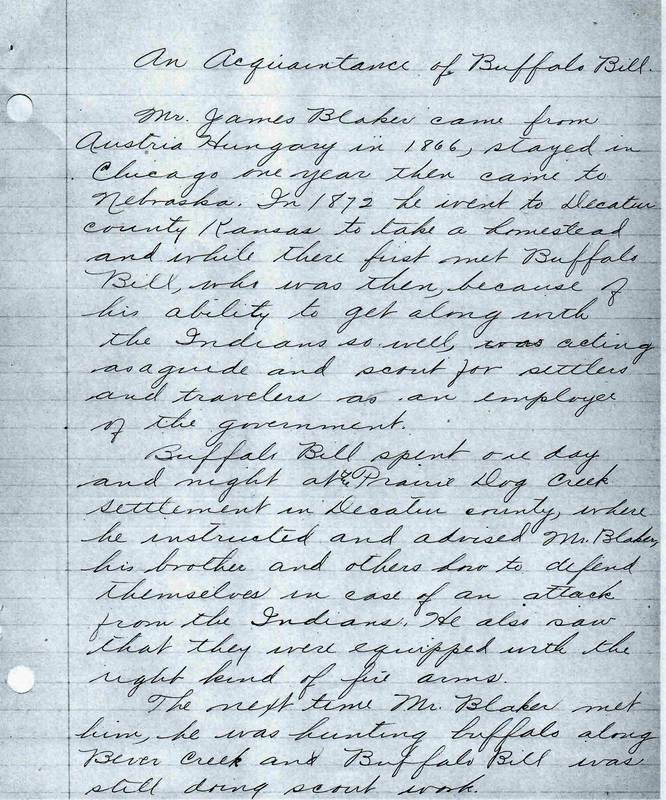 On July 1, 1873, Jonathon Allison (Grantor) to School District 51 (Grantee), by Quit Claim Deed, 1 Acre in the southwest quarter of the northwest quarter of sectio 9 township 2 range 12 Sheridan Precinct, Pawnee County Nebraska, for consideration of $10 as recorded in book m1 page 356 at the Court House in Pawnee City. 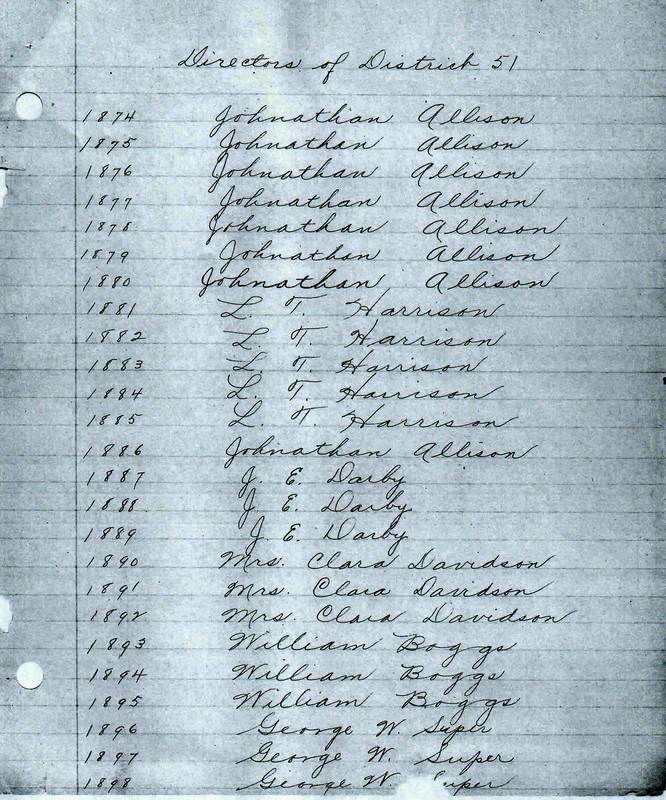 This land ws patented from the United States to Jonathon Allison so that is why it is called Allison school. 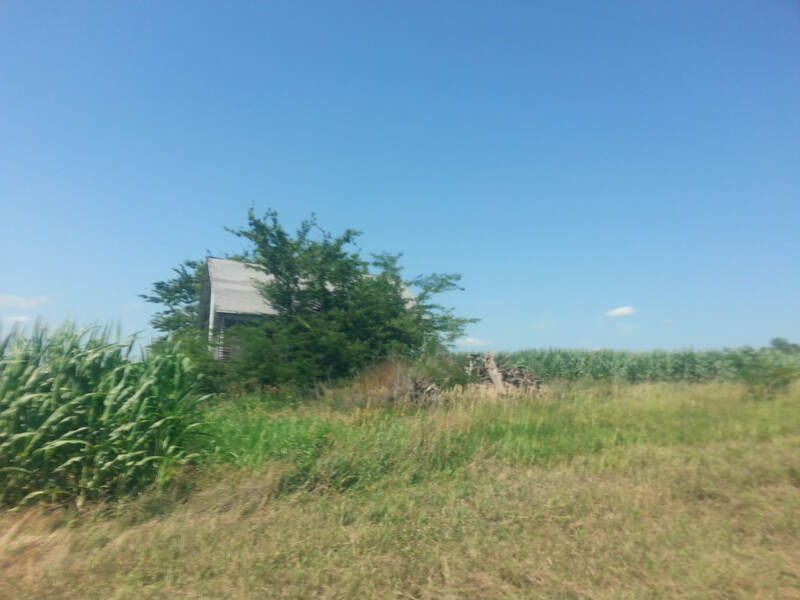 This is approximately two miles south of Table Rock as the crow flies." district 51, long ago, but when? From lifetime Historical Society member Fran Blecha, speaking for her and her husband Bob, also a lifetime member: "The oldest photo that we know of for Dist. 51, Allison School. It belonged to Fred Blaker. Bob has studied and studied this photo, and has guessed that it was taken circa 1900. That being the case, he's pretty sure that Fred is the third boy from the left in the back, age 13. 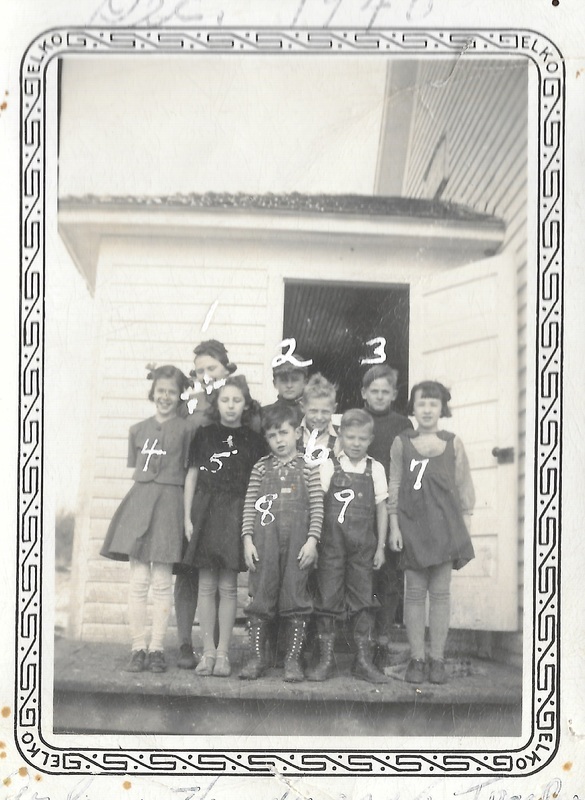 We believe that Fred's brothers are also in the photo - Charlie, age 15, on the right in the back; and John, age 7, third from the right in front. 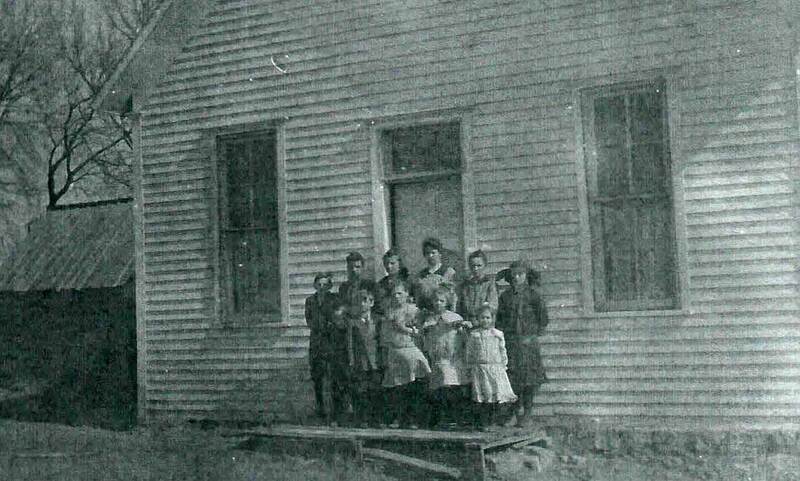 The twin girls, Marie & Emma, died in 1897, so are not in this school picture." Debbie and Howard Blecha own another copy, given to them by Arvid Blecha; their copy is undated, no names, Photo 3066. This is Photo 1383. 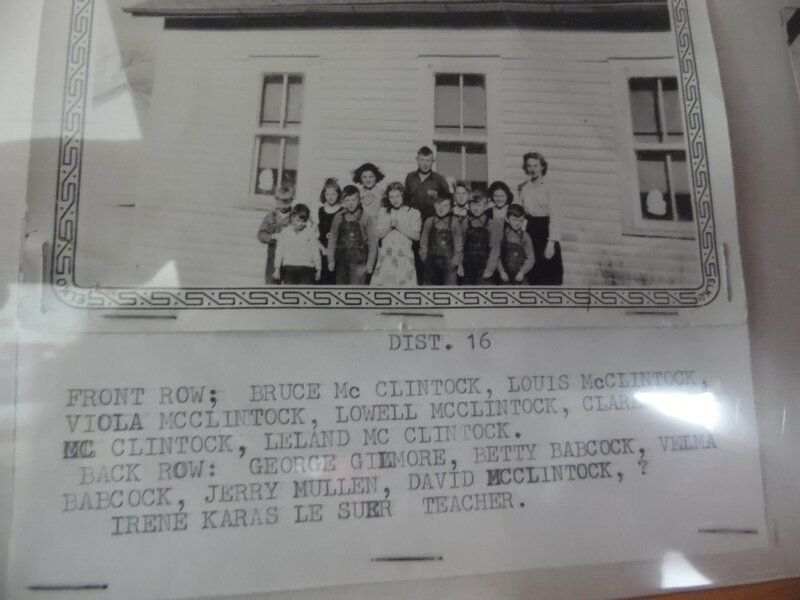 A copy of it is in the collection of the Table Rock Historical Society but the school is not identified and only one student is identified, the annotation about her saying that Dorothy Hunzeker's mom is in the middle row, third from the right. 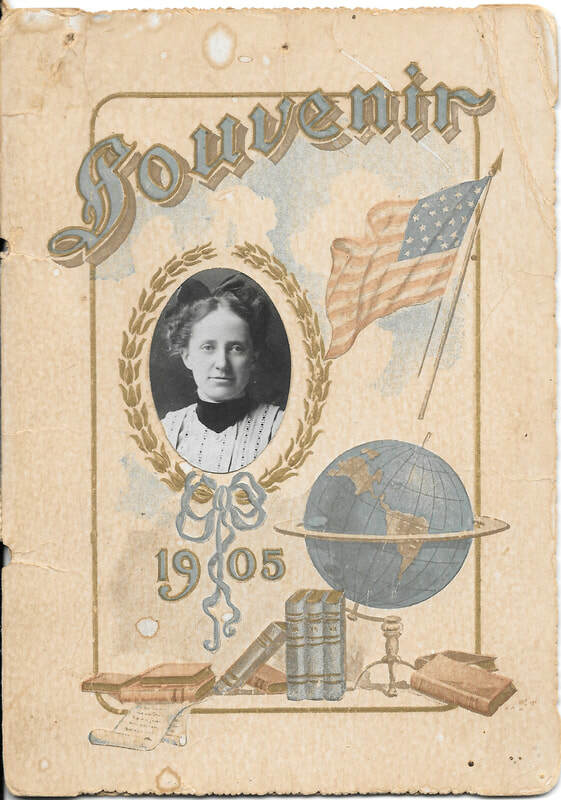 Josephine Karas Hunzeker was born in 1897 and married Rudy Fritch, Sr., in 1916. THEN Bob Blecha, who went to District 51, saw the picture. He knew it was District 51. He produced his own copy of the picture, which was in MUCH better shape. With names! Photo 185, 1912-1913 school year. Member Tim Nord provided this great picture. Photo 4093 from Fran & Bob Blecha. Fran: "Another photo of Dist. 51, unknown date. Josie Hunzeker is standing, on the right, with the songbook. Bob believes that the girl playing the organ is Minnie Kubicek." Bruce Kubick: "Couldn't say for sure, but she looks the part. Was Minnie known to play piano for anyone else around Table Rock?" Fran: "Bob was neighbor to Minnie all his growing years, and neighbored with Elmer Klapka, her son. He says he never knew that Minnie played the piano or organ at all" Bruce Kubick: "I have met Minnie, never knew of her piano ability. She was quite elderly when I met her." 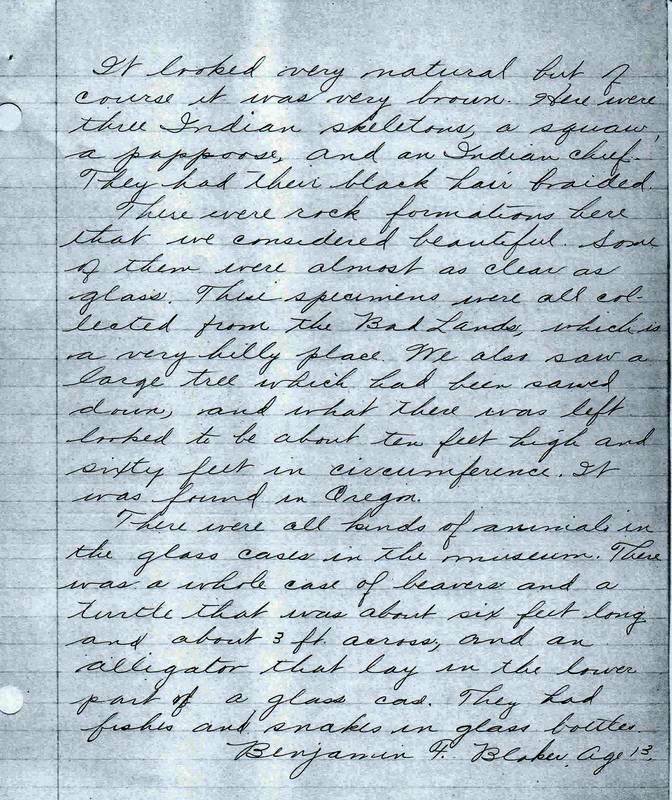 Larry Layden: I wonder if the heavy wire screening on the windows was installed as protection from baseballs, footballs, etc. Ken Anhtholz: Bunke Hill also had those screens. 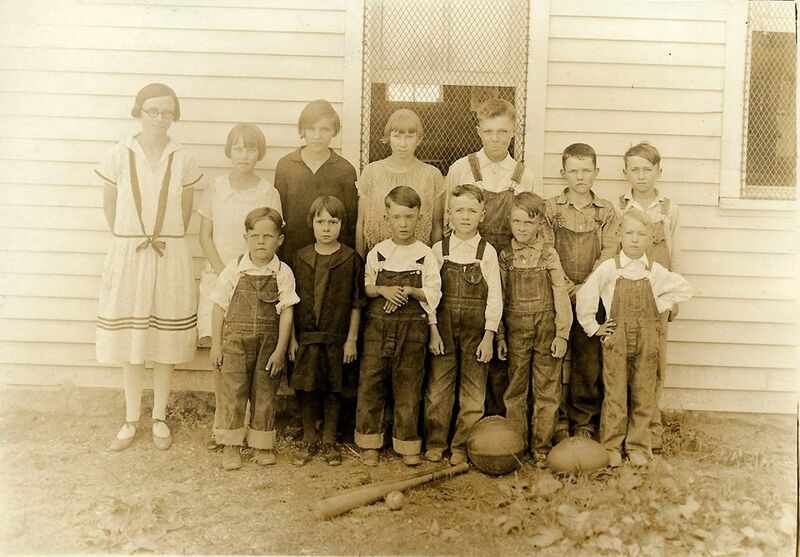 Luella Hinrichsen: Looks like they were ready to play ALL kinds of ball. Gary Anderson: so cute, those boys look like they want to challenge someone to a fight. Fran Blecha: I just love those little overalls. Kay Wenzbauer Edelman: Three of the boys are my uncles. They do look ready to rumble! Dist. 51, Allison School, 1928-1929, Arvid Blecha's photo shared by Fran & Bob Blecha. 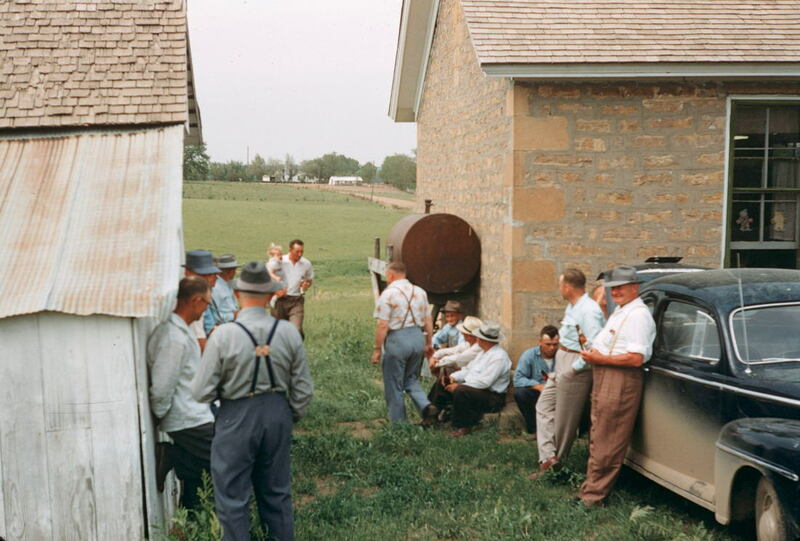 Standing in back, L-R-Irma Vondrasek, Arvid Blecha, Bob Vondrasek, Ted Kubick-teacher; Sitting, L-R-Joe E. Karas, Nettie Karas, Alma Fencl, Roy Hruska, Frank Hruska, Jr.
From Bob & Fran Blecha, Dist. 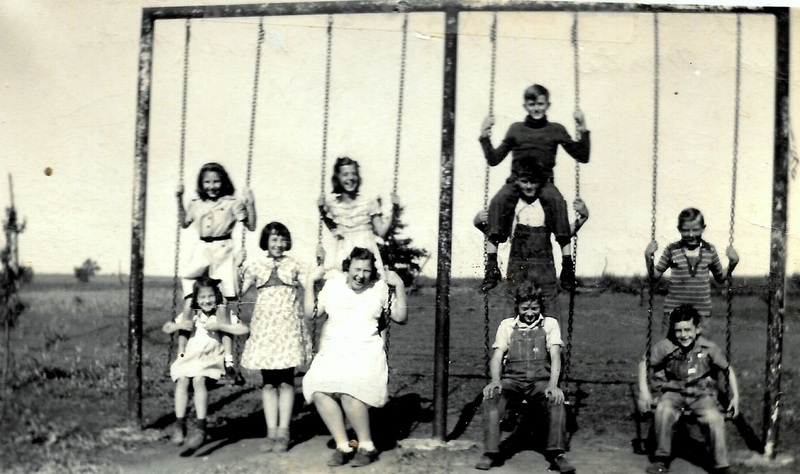 51, Allison School, 1929-1930, students piled on the teeter totter, Arvid Blecha's photo. Reading up, left row: Jess Richardson, Hubert Hunzeker, Daniel Richardson, Irma Vondrasek, Howard Widdifield, Arvid Blecha, Joe Karas, Ruth Schmidt, Rudolph Klapka, Bob Vondrasek. Right row: Ted Kubick-teacher, Alma Fencl, ukn first name Richardson, Louise Richardson, Clyde Hunzeker, Roy Hruska. Dist. 51, Allison School, 1930-1931, Arvid Blecha's photo, shared by Fran & Bob Blecha. Back row, L-R: Alma Fencl, Howard Widdifield, Irma Vondrasek, Ted Kubick-teacher, Daniel Richardson, Hubert Hunzeker, Jess Richardson; Front row, L-R: Clyde Hunzeker, ukn first name Richardson, Louise Richardson, Joe Karas, Roy Hruska, Bob Vondrasek, Ruth Schmidt, Rudolph Klapka, Arvid Blecha. Elsie Fencl, Charles Widdifield, Edd Hunzeker, Charlie Kozak, James Kubick, and Frank Hruska, Sr. 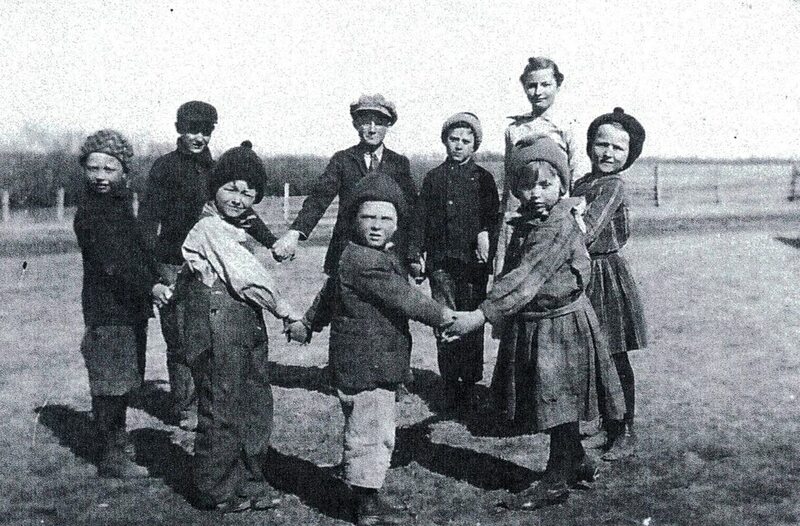 The kids: Rudy Klapka, Jr., Elmer Klapka, Joey Karas, Clyde Hunzeker, Jr., Howard Widdifield, Hubert Hunzeker, Roy Hruska, Alma Fencl, Irma Vondrasek, Loraine Vodrasek, and Bobby Vondrasek. 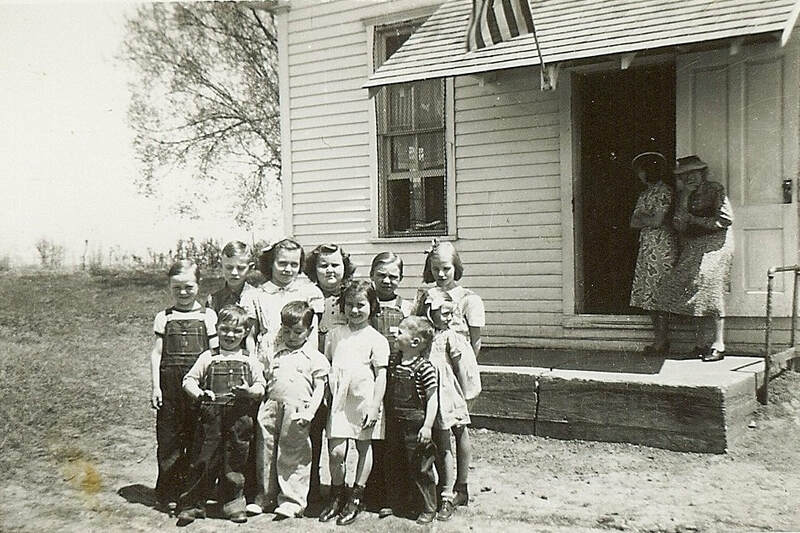 Wayne Knippelmeyer shared this photo dated 1936, saying, "I am pretty sure this is a picture of the kids my mom, Gladys Miller Knippelmeyer taught at District 51 in 1936. There are no names on the back." Photo 4088. Photo 609, shared by Bob Blecha on the Table Rock Historical Society Facebook page. Bob attended the school and posted the picture in memory of his classmate, Ardyce Howell (on the far right). 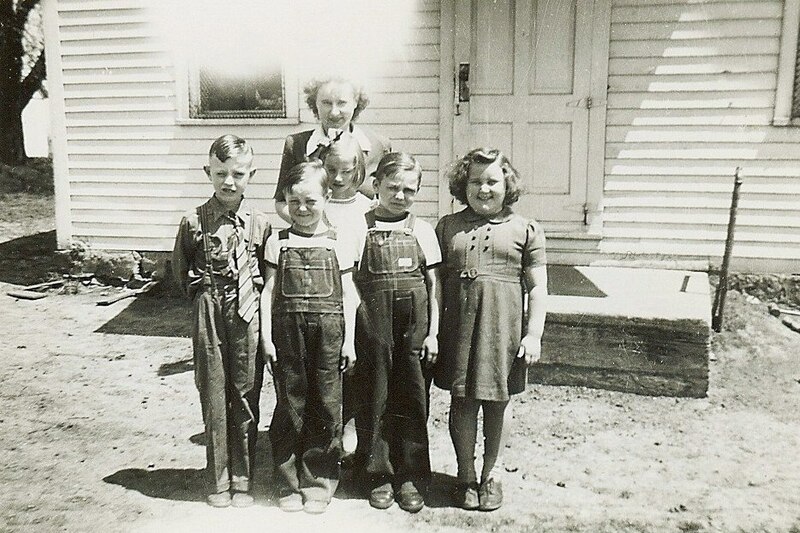 Bob wrote: "This picture was taken circa 1941 or 1942 at District 51, Allison School. The teacher is Mabel Welch (Miller). Pupils, left to right: Emil Kozak, Robert Blecha, Marjorie Epely, Ronald Blecha, and Ardyce Howell. I remember singing many a duet with Ardyce. Rest in peace dear friend and classmate." Here is another District 51 photo from Bob Blecha, not sure of the year. There's Bob on the far left, there's Ardyce Howell, back row, 4th from left. And at the far right, back to front, are siblings Marjory, Maxine and Ronnie Epley. Bob Blecha: "These are pupils from Dist. 51. To name a few of them is as follows left to right back row unknown boy, Teacher Marjorie Mort, unknown boy and girl, Boy in the middle of group unknown, Front row left to right, Ronald Blecha, unknown, Robert Blecha, Emil Kozak. This picture is not taken at the school. We must have been on an outing of some sort. I don't remember. Some of the Kids last name may have been Rice. Also this may have been taken at Pawnee City at the pool park." Photo 4089. The sign from the Pleasant School is in the Maple Grove Schoolhouse Museum. 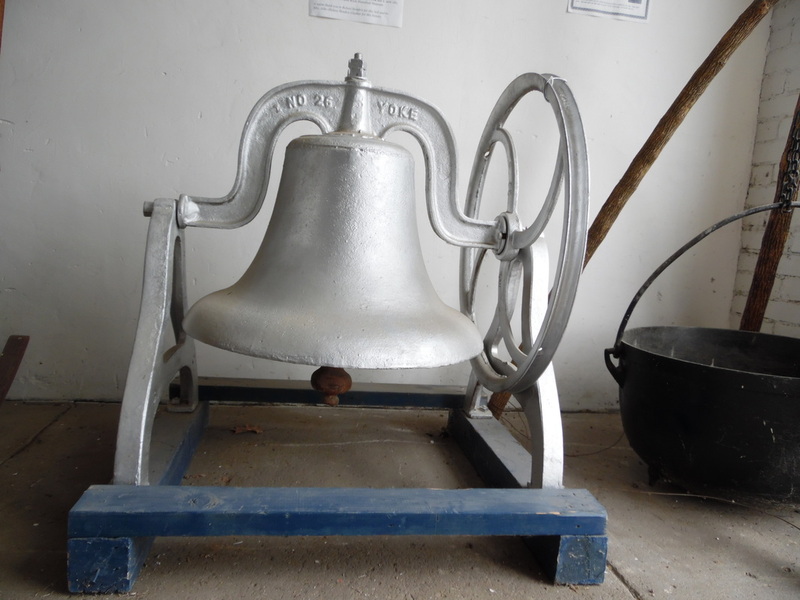 A member of the Hays family, Robert Hendrix, bought this bell after the school district was dissolved and everything sold at auction. It was a sentimental purchase. 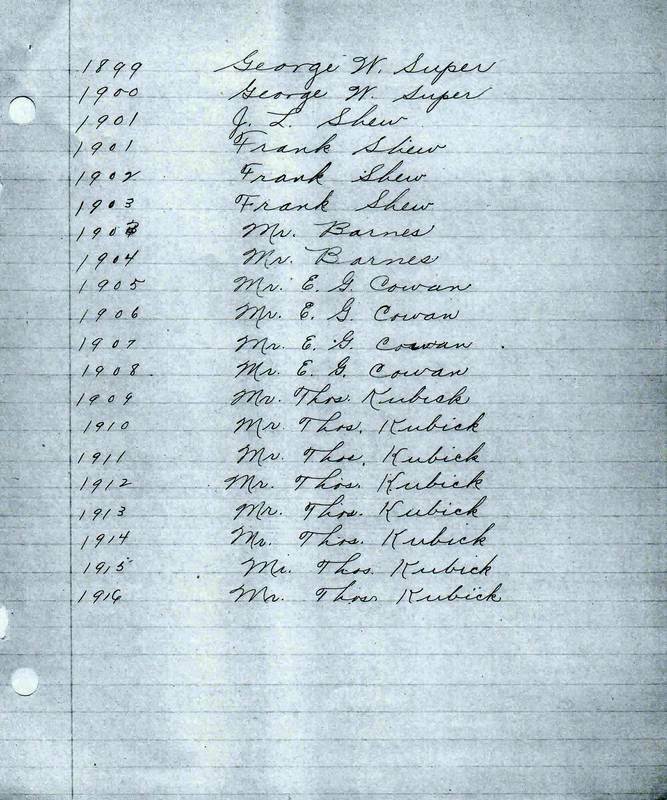 All of the Hays children and all the descendants of Robert and Martha Hays attended Pleasant Hill. The last was Lee Hendrix, who graduated from the eighth grade at Pleasant Hill in 1955. In 1997, Robert Hendrix took the bell to Mount Hood, Oregon. Later, he brought it back home to Table Rock and it now sits, retired at last, in the Table Rock Historical Museum. 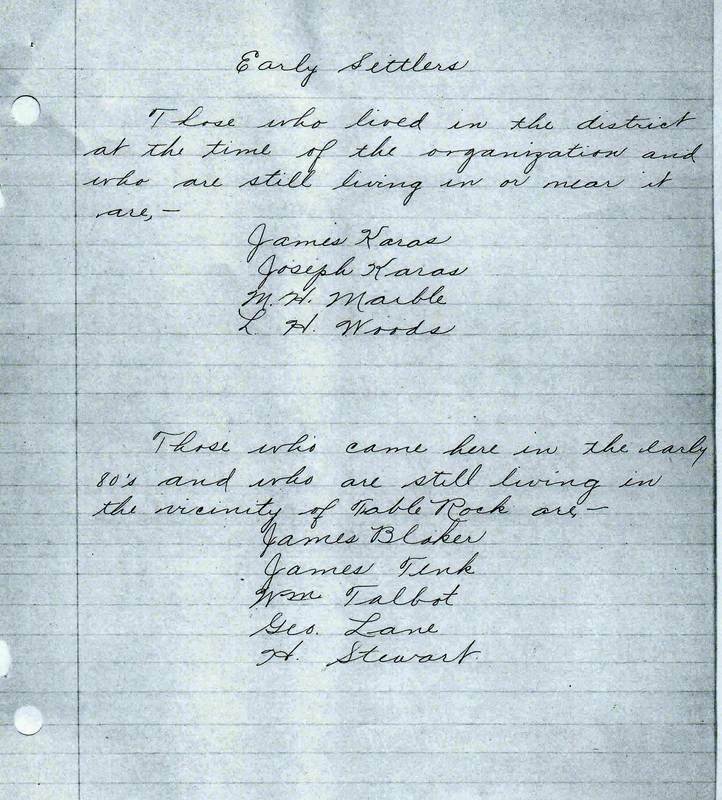 Names mentioned: Teacher Ella Viola Clark. Students: Anna Hruska, Joe Kalina, Minnie Albin, Rudolph Kalina, Jesse Rist, Hellen Hruska, Charlie Kalina, Charlie Rousek, Frida Rist, Hulda Lionberger, Annie Kalina, Leo Lionberger, August Havel, Josie Rousek, Grace Albin, Elsa Stroud, Rudolph Flider, Annie Rousek, James Hruska, Emery Shawham, Elma Stroud, Lou Kadlec, Walter Rist, Hilda Lionberger, :Pauline Kubic, Tony Kalina, John Albin, Lily Blaker, Wilber Stroud, Lydia Rist, Mary Lionberger, school board J. W. Lionberger, Frank Kalina, and Frank Fritch. The sign from the Woodhill School is in the Maple Grove Schoolhouse Museum. Photo 1440. There is a tag on the front and the names are also written on the back. 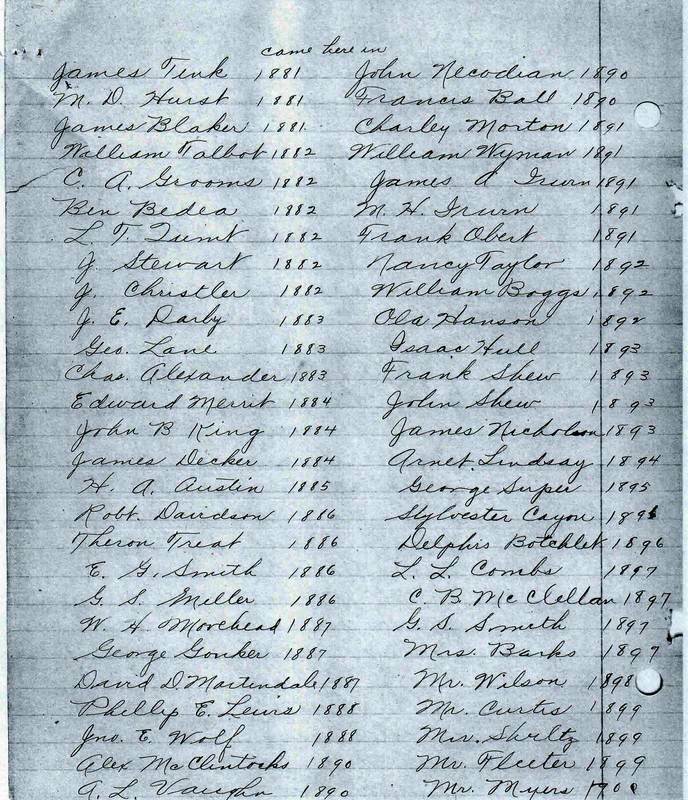 The names are set up differently on front and back and neither set of names seems seem to correlate with the arrangement of people. The students are named: Joan Johnson, Marjorie Mertes, Marilyn Kent, Darleen Mertes, Dorothy Mertes, Vernon Kalina, Marion Kalina, Norris Gold, Allen Gold, and Dale Johnson. Undated. Photo 1436, District 65 students. 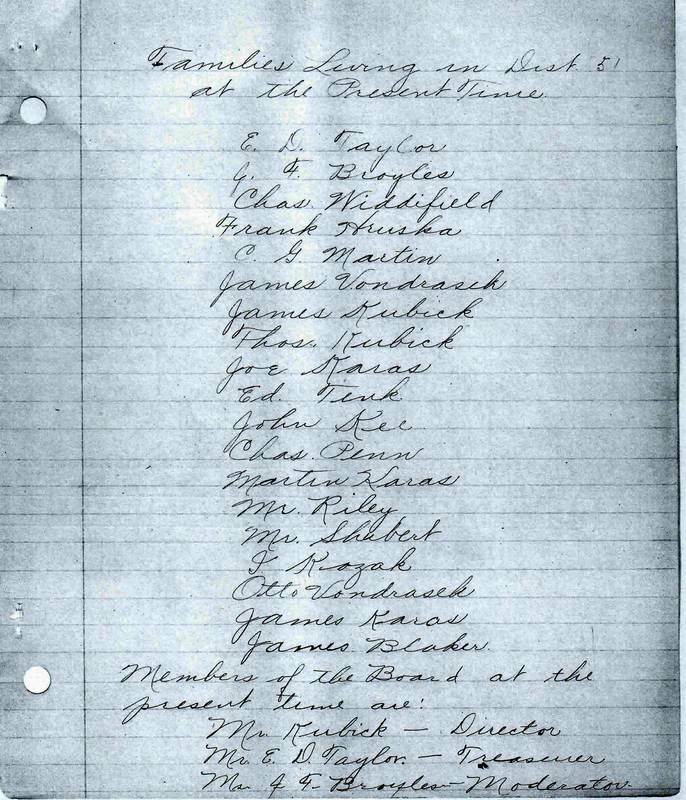 No names, dated December 1940. Photo 281: When was this taken, who are the students? We don't know.